In 4 years of blogging I've mentioned Hostas, shown a couple of pictures of them, talked about snail and slug baits, and posted about our time at the AHS convention; but for some reason I've never specifically posted about them. I'm unsure why that is, but it's high time I remedy that. And yes, this will be a picture intensive post. I grow over 300 varieties of Hosta, it's safe to say I have more Hosta varieties than any other variety of plant. Even though I have so many, I wouldn't call them my favorite plant. I really don't call ANY plant my favorite, as that label is subject to my whims and moods of any particular day. But Hostas are near the top of my list of favorites. Not all Hostas are created equally. There are 61 (give or take a few) species in the diverse Genus Hosta. Some are found in wet areas, some in bone dry mountain crevices; some in woodlands, some in open grassland; some are found at high altitudes, and some are found near sea level. Thanks to hybridization (most Hosta species are interfertile) most varieties we find today can be easily grown following some specific guidelines. Contrary to popular belief, Hostas don't like heavy shade. They prefer bright shade or high shade. Many varieties like some direct morning sun. Some (plantaginea, 'Royal Standards') will even take full sun if they are kept consistently moist. Which brings us to moisture and soil. 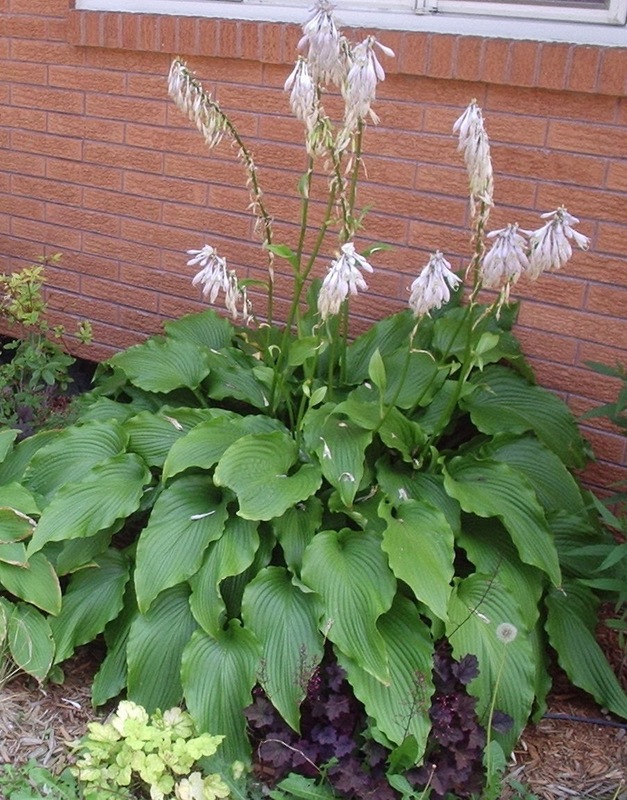 Hostas like organic rich soil that is well drained and consistently moist. Strong growing varieties will tolerate heavy clay, and well established plants are drought tolerant to a point. But what most people put Hostas through is abuse! Use lots of organic matter when you prepare your planting area, consider an annual application of slow release fertilizer, and water well during the summer. Between intense hybridization and their propensity to mutate to many different colors, there are over 8,000 varieties of Hosta. While there are quite a few similar varieties, and some are identical to others, 500 or so are distinct enough to not be confused with any other variety. There is a huge diversity of colors: green, blue, gold, chartreuse, yellow; of course any of those colors may be combined with each other in variegation or with white margins, centers, or streaks. Leaf shape can be long and narrow, arrow shaped, heart shaped, cupped, large or small. The mound can be ground hugging and tiny (as small as a quarter!) to vase shaped or even upright and huge (4' x 8'). Flowers range from white to dark purple and some may even be fragrant. 'Earth Angel' leaf. This plant is still immature and the leaf will get bigger! 'Stained Glass' also has fragrant flowers. 'Sum and Substance' w/ Geranium macrorhizzum 'Variegatum' - It's a much bigger hosta now, this pic is 10 years old. Hope you enjoyed the pictorial journey of the the genus Hosta. Don't forget to check out the modest selection of varieties we sell by clicking here. Thanks Larry! I will note that my hosta collection is spread over 3 properties. My "collection" is at my in-laws, where there is room for me to grow practically anything. As I have been re-vamping the gardens here at home, landscape value is the primary driver of choosing which hostas are planted, and the goal is to stay around 100 varieties. There will probably be a small group of new varieties that come into and go out of the garden, but mostly the hostas planted here are to be show pieces and work within the full context of the garden. And that's really the important thing. Variety name is only important when people ask what awesome plant they're looking at! Or if you really need more of a specific plant. A tip for keeping track of names. Find a durable label (I found the vinyl strip tags used for tree and shrub nursery stock work well) and place the label directly under the root ball when you plant. When you need to divide or move a plant you will find the label. It may take a complete root washing to find it, but it will still be there and the writing will be perfectly legible.